Meline joined other students from St. Gregory Church (Philadelphia) in responding to an article penned by this writer as to why the Armenian language might be dying a slow death in America. The article received wide circulation in the Armenian-American press and drew much response from readers. Like many of her peers Meline attends Armenian School every Sunday at St. Gregory Church and takes advantage of a 45-minute session from her instructors, dividing her schedule with religious education. It isn’t ample time for a language, considering all the distractions one might face in that given period. In the opinion of John Mahlebjian, the 13-year-old sees how the language has evolved over time and insists people must adapt to changes in our culture. «In order to keep our identity, it starts with the language», he believes. «If we can’t communicate words, we can’t communicate feelings. If parents don’t use it in the home, it’s hard for their children to learn.» Armen Almasian, 12, feels the language should take precedence over other church activities and «talking with a priest». Others like Anna Shahtanian, 10, feel it begins with the basics – simple conversation – then a more advanced form. «A number of reasons can be pointed to the lack of Armenian», states Nairi Hovsepian, 15. Daniel Devejian suggests we use what technology has to offer as a way of learning the language through the Armenian Virtual College but that «total immersion with the language and country itself is a must». The AVC offers on-line courses through the Armenian General Benevolent Union to anyone, anywhere, anytime. 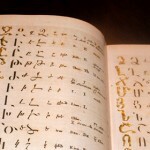 At the moment there are six languages of instruction, including both Eastern and Western Armenian. 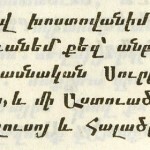 According to Avetis Sahagian the problem with Armenians is self-ingrained and one of division. The only way to save the language is to save ourselves first. «It’s time to adopt Eastern Armenian as the official language for all Armenians», he maintains. «We have two of too many things: two nations (Armenia and Artsakh), two peoples (Eastern and Western), two Catholicoses and two languages. We need to consolidate and unify. Two distinct dialects cause psychological and cultural divisions. We need to end this self-destructive status quo».